I was a few weeks into my education on Western occultism and ritual magick (so spelled to distinguish it from the performance of illusion called magic) when my teacher offered what might have otherwise sounded to me like a far-fetched sales pitch by a possibly crazy person, or at least someone trying to sell me something questionable. At the time, though, I laughed the nervous laughter of a person who truly doesn’t know what to believe anymore and is considering believing in what was previously assumed impossible—you know, because science. But what Alex was talking about is a science of a sort, and I’d come to learn all about it. Weeks earlier, on a Wednesday evening, I had arrived to 126 Baronne, just across Canal Street from the upriver edge of the French Quarter, with a fresh notebook and apologies for being ten minutes late. I was greeted at the door by Emily, a slight, warn-mannered young woman who assured me it was okay. She led me down a hallway lined with colorful, glittery paintings and and statue figures (a tiny Mardi Gras Indian museum for tourists, during the day), through an unmarked door and down a smaller fluorescent-lit hallway, to the back of the building and a tiny room whose ever-open door is that of a bank vault. The room was dimly lit, swirling with incense smoke, and crammed with two round tables, a few chairs, a dresser, two filing cabinets and a shelf, and a couple of lamps, with a whiteboard set up on an easel in one corner. Two women, my classmates, sat with notebooks open. I was offered a splash of wine in a red Dixie cup and a printed handout of that evening’s course material. This was my first day at Academie Gnostique, New Orleans’ own school of magick, the occult, and alternative spiritualities. 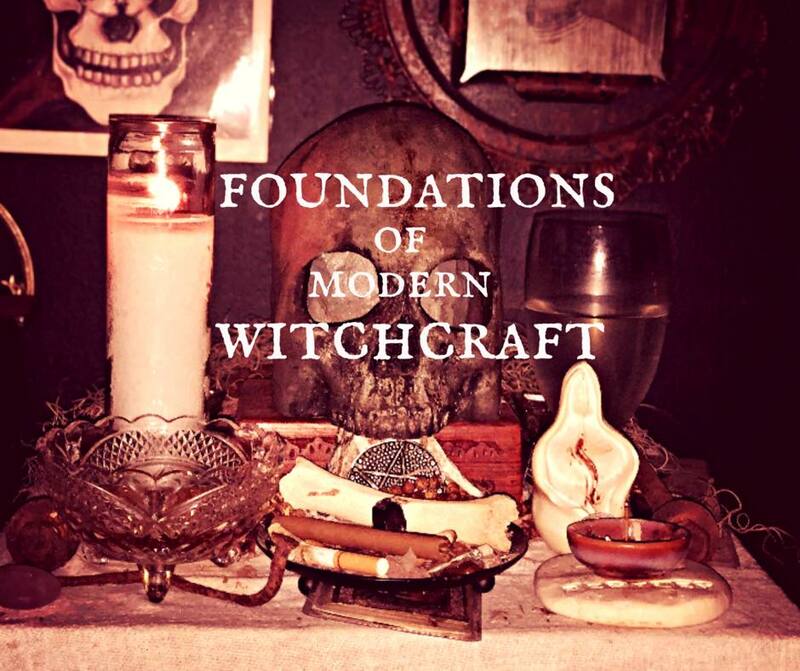 My first class was Foundations of Modern Witchcraft, taught by Rowan Peterson. The other class I chose this semester, for my Thursday night class, would be Occult Philosophy I, taught by Alex. 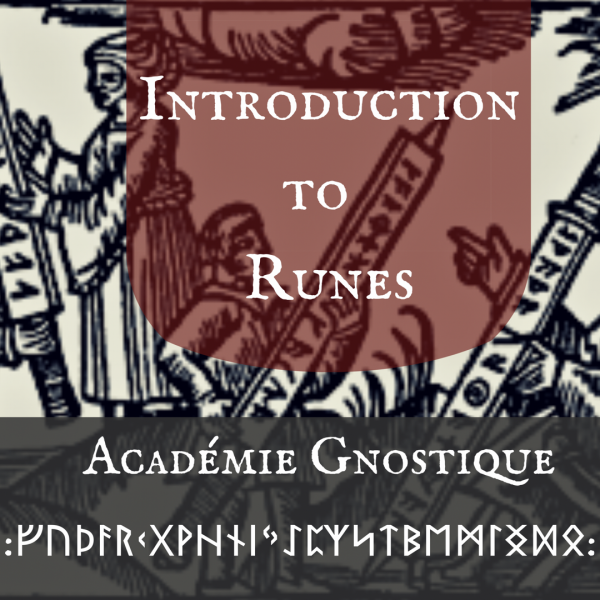 My other choices for the semester were Introduction to Runes, also taught by Alex, Meeting the Fae: A Course in Faerie Lore, Plant Alchemy, Divination and Hoodoo, Conjure, and American Folk Magic. In a city that is so often described, particularly by visitors and enamored transplants, as “magical,” most people seem somewhat unaware of how much real, serious practice of magick is going on around them. It comes in a variety of flavors, referred to as “currents” within the occult world, but practitioners of each intermingle and share not only basic tenants, foundational texts, and philosophies but ritual spaces and social worlds. The whole thing is mystifyingly complex and admittedly intimidating for the dilettante, but the instructors of Academie Gnostique are happy to provide an entry point for the curious (starting with what I took to calling my “magick ABCs”) in the form of more or less formal education. I say “more or less formal” because the flow of classes and student–teacher relationship look a lot less like a modern classroom than the more Classical model of education from antiquity—of dialogue between student and teacher, guided as much by the students’ curiosities and inquiries as the teachers’ knowledge and wisdom about the best direction for the path of learning. It manages, without trying, to work as the “student-centered” approach to education that our formal educational institutions are now trying desperately to graft onto an educational system that is hopelessly structured in a purely pedantic top-down design. Alex feels that he’s lucky to have had a number of teachers in his life, including his uncle who kept him on a more scholarly track in his early forays into magickal study and practice, his father a theosophist Zoroastrian, the Druids who helped him in his wayward youth, and his many respected peers in the OTO, a magical fraternity. “I’ve just had a lot of really great teachers … and that’s why I do schooling.” His most important spiritual revelations, he says, were those that instructed him to teach, and he considers teaching to be his own spiritual dharma. As a native of New Orleans, Alex was raised by a mostly agnostic mother but in a household with heavy Catholic influence, particularly through his grandmother. He had always been exposed to “petty” situational magic—Catholic magick, saint veneration, and the like as well as his mother’s practice of herbalism. Of course, being a child of New Orleans, he was always surrounded by folk magic—he was given his first gris gris by the famous local musician Dr. John. His pursuit of Western ceremonial magick (in the old days termed “high magick”), however, began with a high school research paper on Doctor Faustaus. That inquiry led him to Agrippa’s Three Books of Occult Philosophy, which he found on the internet and printed on his school library’s printer. In this text, he found the language of the four elements (fire, water, air, and earth) he’d learned from his study of Daoist martial arts, reflected in the text’s Platonic roots, combined with the Catholic reverential language of his upbringing, and this offered a reconciliation of his spiritual interests that grabbed his attention. It was after high school that he discovered he had an uncle who had a deep interest in occultism. That uncle first loaned then gave him his own copy of The Key of Solomon, and medieval handbook of magick thought to date back to the 14th or 15th century. “The goal,” says Alex, “is to provide people with access to clarity on the subjects and get them in a place where they can practice and fulfill their own desires and indulge their own purpose in this world.” The teachers of Academie Gnostique want to provide serious education in mysticism, magick, and occult ritual to those who are serious about practicing, but the school is also meant to serve as a sort of entry point for both the sincere beginner and the skeptic. “Some of my favorites are people who are skeptical,” says Alex, “because they feel like they are in a professional academic environment that allows them to judge on their own.” On a more evangelical level, however, Alex believes that if more people can attain a certain attainment of spirituality, it will have a holistic benefit on society in general, as a matter of rising waters lifting all boats. The future of the Academie Gnostique will involve certifications.” AG itself doesn’t have the sole capacity to fulfill all of our standards for such certifications, so the object is going to be to open our accreditation to other organizations “there are great teachers here, and there are other great teachers around town who are doing their own thing, we just want to offers our students the best and sometimes that means taking a health class at a yoga studio that’s not affiliated with us.” There are also plans to expand the campus to the new Botanical Macumba in St. Claude Avenue. For my part, I walked away from my first semester of magick school with a solid foundation in the basics of ritual magick, including how to set up a ritual alter, a fairly basic banishing spell, and a system of meanings and correspondences between cardinal directions, the four elements, moon phases, planetary virtues, zodiac archetypes, colors, numbers, and the Qabalist Tree of Life as well as how natural materials such as stones and plants can be used to direct energies for the fulfillment of one’s will. I’d also made some intellectually satisfying and occasionally amusing connections between the worldview(s) and language of Western occult spirituality and the discourses of both the Christian theology I was heavily exposed to growing up and the iconography of secular pop culture (special shout out to the Teenage Mutant Ninja Turtles and the Prince of Belair.) I may not wind up shooting fireballs out of my hands, but my eyes have been opened to a deeply intriguing world of not only knowledge but possibility. In a world that has become so coldly transactional and rational, and in which we are fairly buried in knowledge disembodied from the knowledge-giver, Academie Gnostique offers to reestablish the old ways both by the transmission of ancient knowledge and the Classical method of that transmission. In the cultural mechanism of anti-modernism that reaches back to the 1880s, this study offers a soothing balm to the chafes of our industrialized, digitized post-modern world. For the intellectually curious, those seeking to dip their toes into a new spiritual practice, or maybe just the open-minded adventurer looking for something interesting to do on a weeknight, Academie Gnostique is one of those little hidden corners of New Orleans into which one can duck to access that ever-sought “real deal” of the city’s oft-touted magick. To find out more, including the calendar for the the Spring semester, you can go their website at https://academiegnostique.com.